When I read Wangari Maathai’s autobiography Unbowed, I was going through one of my lowest points this year. I was feeling tired, deflated and depleted, and questioning whether “all this” matters. “All this” being my struggle for emancipation of women and other oppressed groups. I was so deflated, that I thought I would never blog again. I was tired of the constant scandals and crisis mode that has become of this country. I remember sharing with a friend how tired I was of the fact that the entire year has been characterized by crisis after crisis, with a new scandal emerging almost every other week. I was growing weary from the fact that despite so many efforts, women are increasingly becoming more unsafe, to the extent of being raped while seeking medical care. Looking at the magnitude of what has been happening, I felt overwhelmed and wondered whether what I was doing really mattered. I felt that I needed some inspiration, otherwise, my spirit was going to die a slow death. It was at this point that I picked Wangari Maathai for inspiration. I chose Wangari for two reasons; one being that September was the month that we lost her four years ago, and I thought reading and understanding her cause would be a great way to celebrate her life. The second being that, I established a connection with Wangari at the age of 9, and over the years, I have considered her a soul sister, and I therefore expected her to speak to me during my low. 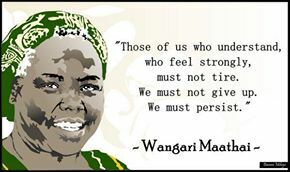 True to my expectation, Wangari spoke to me the way no one else would have at that time. I picked 3 key things from reading the book unbowed: one, the power of voice, two, that no matter how difficult, change is at hand when we persist, and three, that we are never alone, even when it seems that way. As I was reflecting on the power of Wangari’s voice in protecting Uhuru Park and Karura Forest, I realized that that we have those two green spaces in the concrete jungle that Nairobi is, because Wangari decided not to be quiet about it, and instead wrote letters to different government authorities questioning the intentions to build a sky scrapper on Karura Forest and put up private development in Karura Forest. 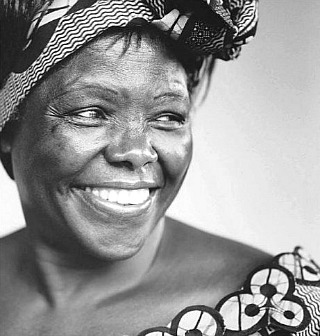 The most profound part of Wangari Maathai’s struggle for change was the year-long vigil held at All Saints Cathedral with mothers of political prisoners, demanding for the release of their sons. For a year, they slept on benches demanding for change, and they did not waiver in their pursuit, until their demands were met. Wangari’s spirit must have had an agenda to reinforce the message because at around the same time, I received a number of comments on my blog, on email and even by my friends, saying that my blog was changing the way they were seeing things, and they were becoming more conscious and found themselves questioning what they would consider normal. That energized me to keep going, knowing that no matter how slow, no matter how minimal, change is coming. She says that this warmed her heart and helped her realize that no matter what happened to her, there were people who wished her well, and who understood what it meant to be a woman fighting for the future of her country. I too experienced that towards the end of the week, when I was feeling as if I was alone in the struggle. I met some wonderful Kenyans that spoke with deep concern about what is happening and the need for change. Speaking to them reminded me that I am not alone, that there are people who care and doing whatever they can in their small ways to change things. So, I may be tired, but I will not give up because I am convinced in the power of my voice to create change, and know that I am not alone, because there are many of us working to create the change we desire. As Wangari Maathai would say in her humming bird story, “I will do something about the fire….I will be a humming bird, I will do the best I can”. Is this really the Nairobi we want? Nairobi is a bustling city. People are always in a hurry – if not to make money, then to spend it. The lucky among us, on consumer goods and holidays abroad. The less fortunate among us on food and school fees. Like an army of confused ants, we’re marching to the CBD, Westlands, Kilimani, Karen. To Kibera, Dandora, Kayole, Kangemi or who knows where. The fortunate ones waste hours sitting in traffic jams. The less fortunate are wearing their shoes out, While the former go to gyms, or upmarket walking tracks to enjoy the joy of walking, the latter are hoping to make enough money to own cars so that they can enjoy the joys of traffic jams themselves. And if not them, their children. It strikes me that Nairobi is not meant to be a place to live in. Or if it is, that little to no effort is made to make the city liveable for majority of its residents. There are but a few green spots. Pavements are mostly non-existent. The city still depends on but a few, almost permanently clogged, arteries. Demand for services, such as education, healthcare, security, transport and electricity, seems to be outstripping the provision of these services. Well-paying jobs are scarce. Recent statistics suggest that the informal economy is far more successful than the formal one in providing jobs, but sadly the jobs in the informal sector often offer little beyond hand-to-mouth living. It is not uncommon to see recent graduates with Masters Degrees performing odd jobs, just to make a meagre living. To some extent governments, local and national, have given up on their responsibilities to provide these services. We can see it in the mushrooming of private schools, we can see it in the fact that lamp posts hardly ever work anywhere. Corruption is rife, and corruption is essentially another tax on the poor. But it is equally true, that we as citizens have given up, or simply cannot even be bothered with anything that moves beyond our private concerns. Rather than demand public services as tax payers and citizens entitled to basic public services, we resort to private solutions to secure just about every basic service. Education? Spend long hours working and sleepless nights thinking of how to make that extra buck to spend -on private education that costs an arm and a leg. If you’re poor, you’re left hoping against the odds, that somehow your children won’t become casual labourers, but will have a better life than you. Healthcare? Get insurance, travel abroad for treatment, or pray to the Lord that one will be spared chronic illnesses. Those that cannot afford insurance and treatment abroad, endure prolonged suffering or death from illnesses that could be prevented, managed and cured by a functioning health-care system. Security? Put up a gate, a fence, or rely on neighbours, who hopefully prove trustworthy. Pray that you are a victim of insecurity, because justice, in a court of law, is unaffordable to the vast majority of people. Transport? Walk long hours on end, for majority of the population. For the struggling middle class, spend a substantial amount of your salary on matatus, or spend a small fortune for the privilege of becoming a target for traffic police who seek to supplement their income by hook or by crook. While the urban poor are mostly spared traffic police, they have to deal with askaris. We’re being conned so often, that the highest recommendation for a service provider seems to be that they have not even tried to con you. We all act as if Chapter 6 of the Constitution is entitled “Impunity”. Nairobi produces and reproduces dysfunction, and as long as our mind-sets don’t change, we’ll have to face the realities of floods, carjackings, polluted air, robberies, corrupt city/county council askaris and traffic police, clogged roads, and sub-par education. Is this really the Nairobi we want?